Summary: Our research group was the first to demonstrate (experimentally) that feedforward techniques can effectively compensate for movement-induced vibrations to enable high-speed nanopositioning in Scanning Probe Microscopes ( Ref 2 and Ref 3). A review of control issues in nano-positioning can be found in Ref 4 and a review on the use of feedforward control to nanopositioning can be found in Ref 5. This applied research has focused on the use of inversion-based approaches to solve challenges in nano (and sub-nano) scale precision positioning needed in scanning probe microscopes such as the atomic force microscope (AFM) and the scanning tunneling microscope (STM), e.g., see Ref 1. It is noted that the AFM and STM are key enabling tools in the nano area; therefore the current work aimed at increasing their throughput will have a significant impact on the real-time investigation and manipulation of nano-scale and sub-nano-scale phenomena. For example, the inability to precisely position an AFM probe (at high speed) over a cell surface has traditionally limited the ability to image time-varying dynamics of cellular processes. In particular, lack of precision positioning (due to movement-induced vibration) leads to excessive forces on the cell surface (as the probe digs into the cell) and causes sample damage. Therefore, current AFM imaging of cells is limited to low operating speeds. Our research group was the first to demonstrate (experimentally) that feedforward techniques can effectively compensate for movement-induced vibrations in Scanning Probe Microscopes ( Ref 2 and Ref 3). Thereby, we showed that feedforward inputs could be used to increase the operating speed of Scanning Probe Microscopes. Our current research aims to alleviate similar vibration-caused positioning problems during high-speed imaging of soft biological samples. The resulting high-speed AFM will enable the investigation of dynamic cellular functions such as migration. Thus, the current research on high-speed AFM imaging of human cells will have a significant impact on future investigations of important issues in health and disease such as the effects of aging on cell migration and the subsequent effect on re-vascularization of ischemic tissue (for the treatment of heart disease). 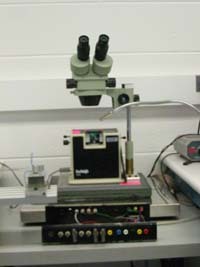 High-density disk-drive storage systems require nanometer scale positioning of the read/write head. Algorithms for nano-precision, high-speed, positioning using dual-stage systems were investigated under this research effort, which was funded by the Information Storage Industry Consortium (INSIC), which consists of companies such as Seagate, Hitachi Global Storage, Samsung, and others. A description of the research results can be found in these presentation slides. Ref 1: Q. Zou and S. Devasia "Preview-based Optimal Inversion for Output Tracking: Application to Scanning Tunneling Microscopy," IEEE Transactions on Control Systems Technology, Vol. 12(3), pp. 375-386, May 2004. Ref 2: D. Croft and S. Devasia "Vibration Compensation for High Speed Scanning Tunneling Microscopy," Review of Scientific Instruments published by the American Institute of Physics, Vol. 70 (12), pp. 4600-4605, December 1999. Ref 3: D. Croft, G. Shedd and S. Devasia "Creep, Hysteresis, and Vibration Compensation for Piezoactuators: Atomic Force Microscopy Application," ASME Journal of Dynamic Systems, Measurement and Control, Vol. 123 (35), pp. 35-43, March 2001. Ref 4: S. Devasia, E. Eleftheriou and S. O. R. Moheimani "A Survey of Control Issues in Nanopositioning," IEEE Transactions on Control Systems Technology, Vol. 15 (5), pp. 802-823, September 2007, Special Issue on Dynamics and Control of Micro- and Nanoscale Systems.